Our journey towards St. John’s next brought us to Harbour Grace for our first From This Rock dinner. We also spent the night in a church! Ok, a former church. And it’s not like we were too cold to camp, busted in, and slept on the pews. Cupid's Haven is a B&B located in what used to be St. Augustine’s church, near the town of Cupids. It’s owned by Derek and Charmaine Akerman, and Shauna and Darrin Akerman, who purchased St. Augustine’s when it came up for sale. They spent a year on renovations, then opened as a B&B and tea room in 2005. It’s a unique space to be in - cozy and comfortable, yet also very grand. I can imagine few settings more dramatic than this one for a kitchen. After settling in, we drove to nearby Harbour Grace to attend the From This Rock dinner taking place that evening. 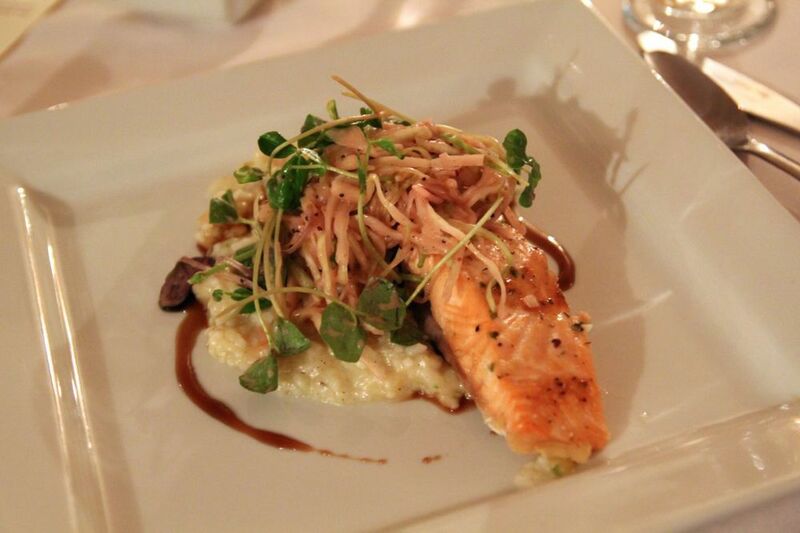 The event in Harbour Grace was part of a culinary tour across Newfoundland, organized by the Restaurant Association of Newfoundland and Labrador in collaboration with the provincial government. 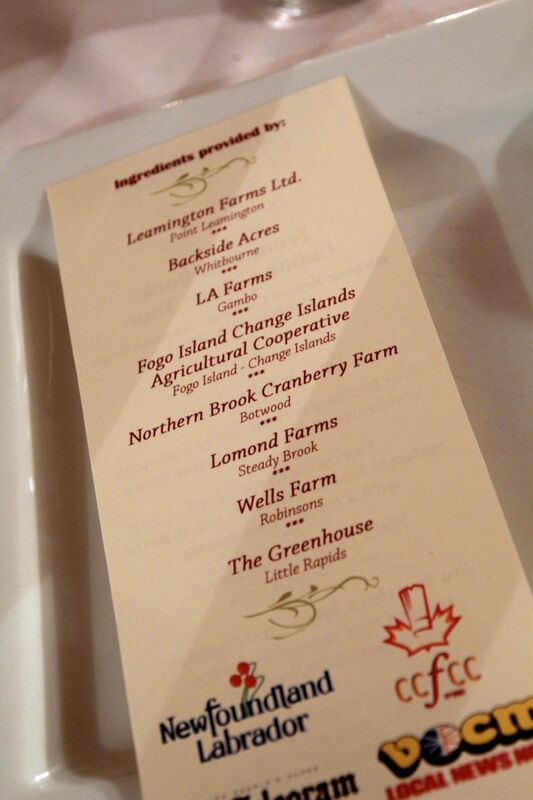 The tour brought chefs together to highlight the culinary talent within Newfoundland, as well as its local food. Decades ago, the province was far more agriculturally self-sufficient, but eventually it became more and more reliant on imports. There’s now a growing movement to encourage Newfoundlanders to buy local, and the culinary tour proved there’s no shortage of amazing things to be eaten on The Rock. And eat we did! 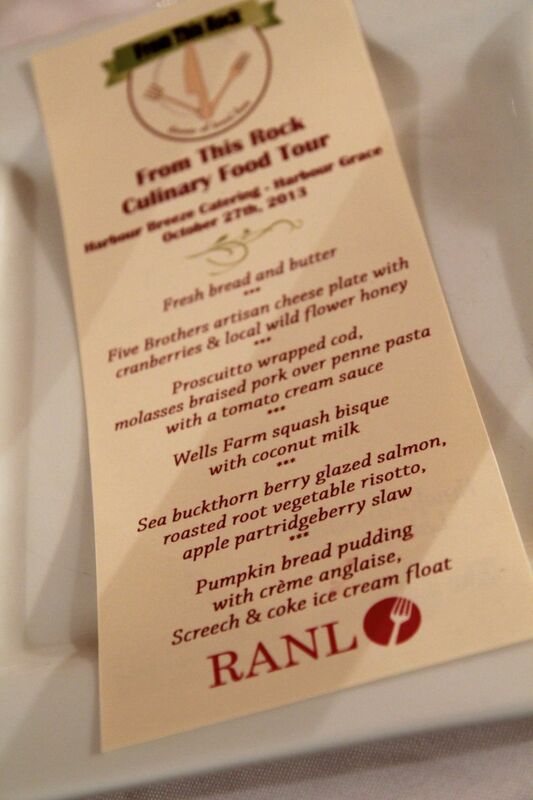 The dinner took place at Harbour Breeze catering centre, and chefs Roger Andrews, Shaun Hussey, Adam Blanchard, Gary Gosse, and Angie Ryan prepared the feast. I had a hard time not completely filling up on the bread, biscuits, cream, and jam that first arrived in cast iron skillets, but I was wise not to. They were followed by cheese, cod, pork, pasta, squash soup, salmon, apple partridgeberry slaw, bread pudding, and many other treats. The final thing to hit my lips was a screech and coke ice cream float. BOOM! The cheese came from Five Brothers, the province’s first artisanal cheese company. Adam Blanchard is the young chef and owner behind it, and he’s literally a pioneer in the industry; he’s working with the province to establish policy around the use of local milk for cheese making, which just goes to show the potential for young Newfoundlanders in the culinary scene.